Police could be given new powers to enforce curfews for offenders who are electronically monitored. Ministers also plan tougher sanctions for prisoners who breach the terms of their release under the tagging scheme. It follows the case of Craig McClelland who was murdered by an offender who had cut off his electronic tag. The change, if passed, would give police new powers of search and entry to apprehend offenders who breach a home detention curfew (HDC). 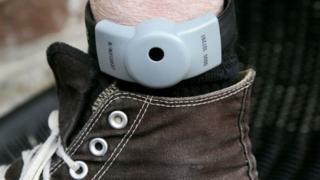 HDCs came into use in Scotland in 2006, and allow prisoners to complete part of their sentence on licence in the community while wearing an electronic tag. Offenders' whereabouts are monitored and they are typically required to remain at a certain location in the evening and overnight. Since its introduction more than 21,500 offenders have been released in this way, and the scheme is being expanded. But the system came under scrutiny following the murder of Craig McClelland by James Wright in a random street attack in Paisley in July 2017. Wright had removed his electronic tag and breached his home release curfew five months earlier. A review of the electronic monitoring system by the prisons and police watchdogs in the wake of the case highlighted a number of weaknesses. Last November a cross-party call was also made for an independent inquiry into the circumstances that led to the father-of-three's murder. The move was backed by Mr McClelland's family who told BBC Scotland the crime "should just never have happened". Justice Secretary Humza Yousaf said he planned to create a specific offence of being "unlawfully at large" when an offender does not immediately return to custody once their licence is revoked. This would strengthen the sanctions available. Another amendment to the Management of Offenders (Scotland) Bill would mean criminals can no longer be released on HDC if they are serving a long term sentence. Mr Yousaf said: "Scotland's reoffending rate is at a 19-year low and the continued expansion of electronic monitoring increases the options available to manage and monitor people serving all, or part, of their sentence in the community. "Last year we accepted all the recommendations of HM Inspectorate of Prisons for Scotland and HM Inspectorate of Constabulary in Scotland in their independent reports into the use of HDC. "By creating a specific offence of remaining unlawfully at large and introducing changes to the rules around HDC we will further strengthen this important part of our justice system which prepares prisoners for release, reintegrates them into the community and reduces the risk of them reoffending." Scottish Conservative justice spokesman Liam Kerr said the move was a step in the right direction, but said the SNP would still be letting some criminals "off the hook". "It must always be a new offence to cut off an electronic tag, as I will be proposing in Parliament on Tuesday."